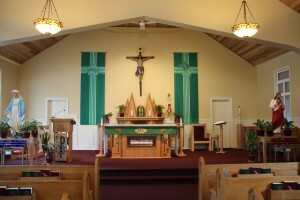 Welcome to Our Lady of Good Hope Parish! A warm welcome to all visitors and welcome to newcomers who have recently moved to our Parish. For newcomers, we invite you to fill out the Parish Registration form found in the “Parish Information” page. 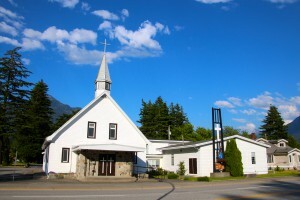 Our Lady of Good Hope is a Roman Catholic Church in Hope, British Columbia, Canada. The Church is nestled in a beautiful scenic valley surrounded by majestic mountains. About one hundred feet from the front entrance doors of the Church the Fraser River swiftly flows. All highways lead to and travel through Hope. We welcome all visitors to visit our faith community when traveling through Hope. Please introduce yourself to Father Gordon, he will be glad to meet you. When you visit, please join the community for coffee and goodies after the Sunday 9:00 AM Mass in the Parish Hall. Thank you for your visit to our website. We hope you enjoyed your visit and we invite you to come back again to check for updates. May God bless you! Note: tap the picture with your mouse to enlarge the picture.